VENTURA, Calif.—(BUSINESS WIRE)— XerTech Inc. (OTCBB: XTCH), a leading manufacturer, seller, and distributer of cutting-edge, interactive fitness systems, today announced that it will showcase its XerGame products at the US Open Tennis Championships, starting today, August 31, and running through the end of the event on September 13, 2009. 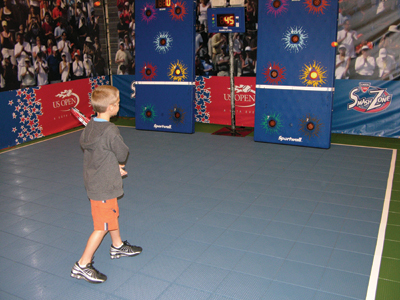 The interactive ‘SmashZone’ area at the US Open will showcase a series of engaging XerGame products, located in the Indoor Training Center of the USTA Billie Jean King National Tennis Center in New York City. XerTech will provide fun and fitness for attendees of all ages using several products from its highly interactive fitness and sports training lines, including: the Sportwall XerPro™, the Sportwall XerTrainer™ and the XerDance® multi-player dance game system. The US Open is consistently the highest-attended annual sporting event in the world, with record crowds anticipated in 2009. The 2008 US Open drew more than 720,000 fans. More than 70 million viewers watched the 2008 US Open on CBS Sports and USA Network, and international broadcasts reached 185 countries. The 2009 US Open will be held Monday, August 31 through Sunday, September 13, 2009. XerTech is committed to creating fun, entertainment-based interactive fitness programs, sports training programs and equipment that place specific emphasis on developing the neurological pathways in the brain. The programs and equipment offered by XerTech cover a diversity of applications, ranging from combating obesity in youth, adults and seniors to conditioning high performance athletes, from medical wellness to education for PE, adapted PE and special education. Over the years, XerTech’s R&D initiatives have resulted in cutting-edge programs and equipment sold to the commercial fitness industry and educational institutions (there are over 1,500 installations worldwide). XerTech’s programs and equipment have pioneered a new paradigm in training and fitness that joins computer game technology with conventional exercise programs, appropriate for the multi-billion dollar healthcare and rehabilitation, fitness, athletic performance, computer game, and family entertainment markets. XerTech Inc. (OTCBB: XTCH) manufactures, markets, distributes and sells high performance training equipment and programs based on a new paradigm that joins computer game technology with effective exercise to achieve greater brain/body stimulus and interaction. We believe that we are the only company to manufacture, sell, and support fully turnkey commercial systems to the health, fitness, sports performance and education industries. We seek to capitalize on two basic economic and social trends, (i) the growth and success of interactive computer games and (ii) the recognized need in the industry for fitness and training systems that will attract the mainstream population by supplying FUN products that make people FIT. XerTech Inc. has developed and patented the Sportwall Performance PT®, Sportwall® Training Stations, XerTrainer™, XerPro™, the XerPlay™ Interactive Playgrounds, and the XerDance® multi-player dance game system. In addition to manufacturing and marketing its own product lines, the Company distributes Trazer® by Cybex®, Trixter® Interactive Spinning Bike and the Makoto Arena®. For additional information, please visit XerTech’s corporate website: xergames.com.